The weirdest thing happened this morning when I went to check on how last night's muffins had fared overnight. The rhubarb ones all turned inedible. They had gotten soggy, likely from storing them in tupperware too soon. I thought they were cool when I packed them away, but upon speaking to a friend, she suggested I leave them out for about three hours before storing. The muffins that ended up being great were the blueberry ones that I made normal (not mini) size. I pulled them out of the oven last night at 11:30, plopped them on a cooling rack, covered them with a towel and went to bed. They were the perfect level of moistness this morning. I brought those big ones to school and the feedback I got was overall positive, just that they were a little grainy. Today I went back to work. 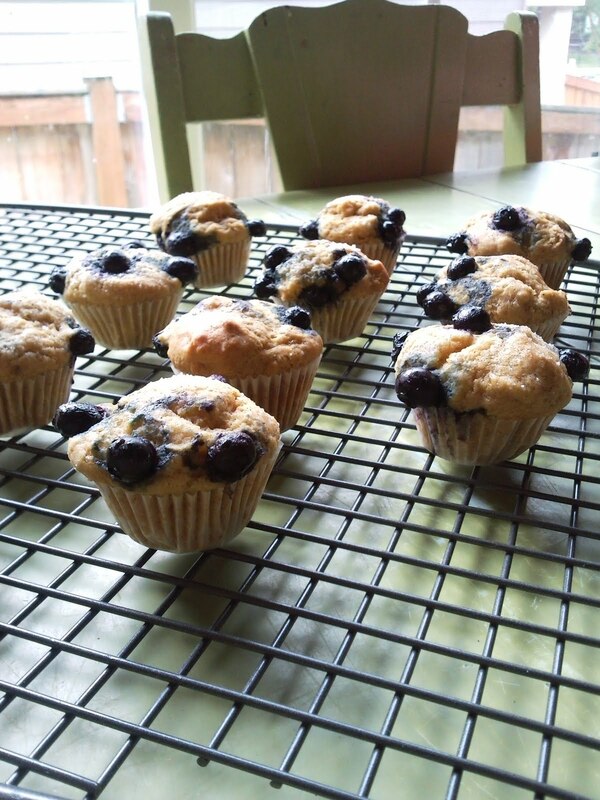 I adapted the rhubarb muffin recipe to use blueberries instead. I also used the Bob's Red Mill mix instead of the flours it called for. 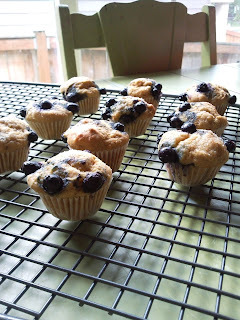 I practiced three different ways of getting the blueberries in the muffins, as well. First batch we set them on top, second batch we put in some batter, put on the blueberries, then put more batter on. The last batch I pressed them in to the tops a bit. Though time-intensive, the second way worked the best. I baked them just right, too! It seemed 21 minutes in the oven was perfect. They are almost perfect, but I don't think I am a fan of the Bob's all-purpose baking mix. The recipe made 36 mini muffins and I ate a few of them, so I'll bring the rest to school and see what they think there. Next I'm going to try a recipe from the Whole Life Nurtition book for Quinoa Banana Apple Muffins. These call for mostly quinoa flour, a whole other new thing for me to try. They are chock-full of healthy stuff, too, so I'll cross my fingers they work! ETA: I got word back these muffins were a big hit. Exciting! I priced them out and they came out to about $7.16 for the whole recipe with the Bob's Red Mill blend. If I had used the flours the recipe called for it would have come out to $6.29 for the batch. I subbed BRM for only two flours, so it wasn't that difficult to do. To confirm, this recipe made 36 mini muffins. I used a variety of types of ingredients, as well. Organic orange for the zest, but regular OJ in a jug. Conventional frozen berries. Conventional apple sauce. Store brand canola oil. Organic agave. The price would, of course, increase if I used more organic ingredients. Probably quite substantially. I should add that this total included $.72 for mini muffin wrappers. Keep at it! You'll get it if you keep tweaking things! Have you been to The Grainery in Burien? I think their flours and bulk foods are a lot cheaper than PCC (though I haven't actually price checked). And they do have a decent amount of "alternative" ingredients for allergen free baking. Worth a check -- we love it there!